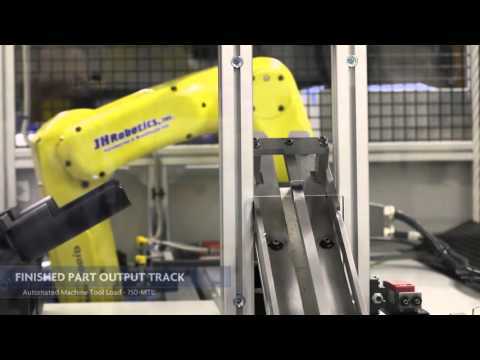 - About - Latest Robotics Integrations - JH Robotics, Inc. Check out the latest innovative robotics integrations and be sure to request an integration estimate today to learn how we can transform your facility by reducing costs, increasing output, and shortening production times. Back-to-back automated machine tending featuring two MTL-150 cells for OP10 and OP20 operations. A two pallet input/output system allows for continuous operation. Call 800-826-8069 to learn how we can help you increase production and lower costs by integrating automation into your facility. JH Robotics was approached by a long-time customer wanting to increase part production in a big way. 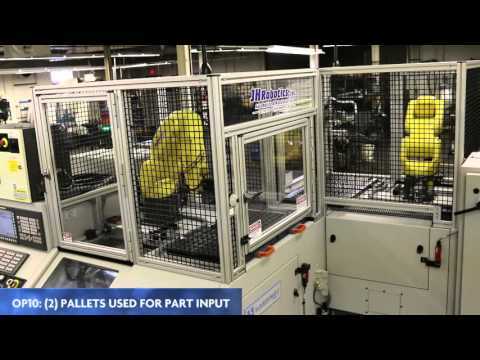 JH Robotics engineered a three cell solution which featured three of our MTL-150 machines working in unison to boost production, decrease part rejection, and operate lights-out. The resulting installation allowed the customer to keep up with demand and stay on schedule with production. Federal regulations require a firearms company to test fire each gun it manufactures. This process requires a constant demand for loading magazines along with routine maintenance and tedious hand assembly. 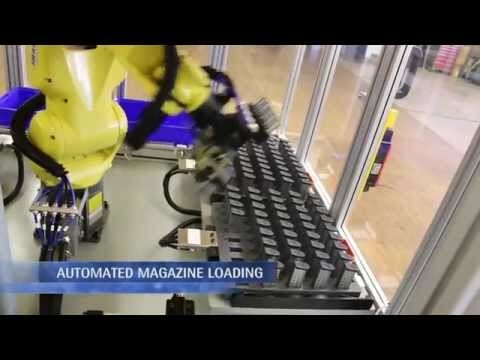 JH Robotics designed and completely tested a system for a major firearms manufacturer that will load magazines for all pistol rounds and 22 rifle rounds. The automated solution we custom built for this customer leverages efficiency and ease of operation to load trays full of magazines while being completely unattended. The cycle time per magazine (any size) is less than 30 seconds. Changeover between magazines is as easy as loading the magazine and bullet trays into the cell and pushing the button. Learn more about firearms manufacturing automation.